Karnala FortHeight : 2500 ft. While going on the Mumbai-Goa highway we might have noticed a thumb like rock resting on a mountain. As we leave Panvel, the road towards Pen goes through green forests, and suddenly we have a glimpse of this pinnacle. 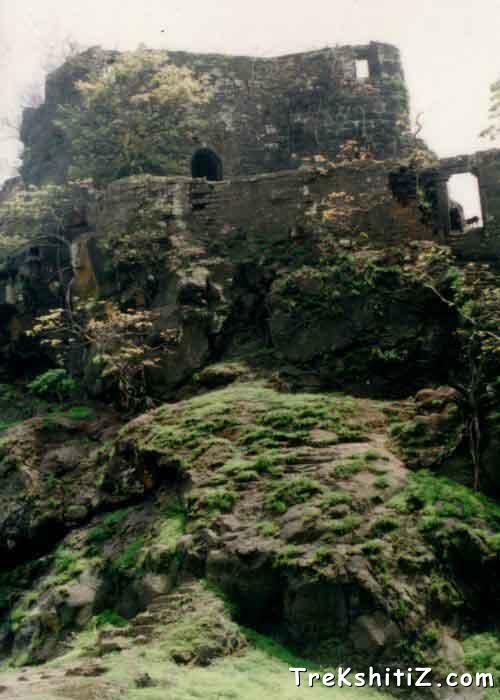 That is the fort of Karnala; famous for its strange pinnacle and the bird sanctuary that is setup in the forests below. This was an important fort and dates back to 12th or 13th century. The history of the fort is also interesting. Till 15th century the fort was under Nizamshahi rule. When Shivaji wanted to capture the fort, his army initially surrounded the fort. They built temporary obstructions and continued to attack. After a few days, they captured the fort. After that the Moguls, the Angres and Peshwas ruled the fort. In 1818, colonel Prother of the British captured it. Finally the tricolour was furled here. However the cisterns here show that the fort is ancient and dates back to 12th century. The inhabitants are the tribal Adivasi people, who represent a simple living and a life full of struggles. The art of these people is worth, and they still have preserved their tradition. Their paintings are called �Warli� paintings, and are worthy of appreciation. Their life is simple and still they adopt conventional methods of earning. A movie in Marathi was featured on the folks, which enabled many to know about the people and their culture. As we proceed ahead of Karmaidevi temple, we ascend through the main entrance door. Going right is the way to the base of the pinnacle and the caves carved out in it. The northern face of the pinnacle houses many beehives. Hence no sound should be made while going this way. Going rightwards we can see another entrance, but the way here is bit difficult. If we go to the left side, there are remnants of old dwelling places. Here are some tanks. There are many cisterns near the caves, but none of them contains potable water. A cistern on the left side, near the remnants, towards steep side of the fort contains drinking water. We enter the fort from northern side. Going southwards beyond the pinnacle, we can observe the ramparts in good condition. We climb some steps and come to the southern Machi. This face of the pinnacle is clear and suitable for rock climbers. A further southward is another bastion. On the entrance here are the carvings of �SHARABH�, which is a legendary animal. Here are the remnants old constructions. On the western face, there is not a clear way. Some caves are situated here. From the top of the fort we can see Prabalgad, Irshaalgad, Dhaak and forts of Rajmachi. On the west are Mumbai and Elephanta islands. The forts visible from here show a strong network to keep a check on the surrounding region. The bird sanctuary is situated near the region of the fort. The sanctuary covers an area of 4 km. More than 150 species of birds have been observed here. These include Malabar Whistling Thrush, Paradise flycatcher, varieties of kites, owls and bulbuls, Maina, Ayora, Shaheen Falcon and many more. Bird watchers should be alert and should roam in small groups, or the birds may not be seen. Muniya and parrots have been caged here. Animals like porcupines, rabbits, monkeys, etc. are found here. Some rules like prohibition of fire and no injury to any wild animal are to be followed strictly. Now-a-days good resorts have made their way here and solved the problem for tourists. One has to board a bus for Panvel. From here we get many buses to Karnala. Any bus travelling on the Mumbai-Goa highway takes us there. Here we enter the bird sanctuary. From here two ways go to the top of the fort. The way to the right goes through the forest, whereas a more simple way goes to the left. As we proceed from the left, we reach to the temple of Karmaidevi in one and half hour. The caves are better to stay, but recently there are many beehives over them. Hence one has to stay there at risk, as a small noise can distract the bees. Water is available in a cistern near the remnants on the left side of the main entrance. 1-� hours from the base village. In recent days many beehives have been formed on the front face of the pinnacle. Any small noise can result in chaos within the bees. Not to make any noise near the pinnacle. If a bigger group is there keep left while going to the backside of the fort.